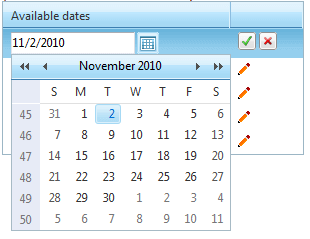 Binding a RadTimePicker control to a data source is easy provided you use the DbSelectedDate property. It works almost like the SelectedDate one, but does not throw an exception when given a null value. When embedding RadTimePicker control inside a data-bound control, use a data-binding expression to bind the value of the input control to the data source of the parent control. Data-binding expressions are contained within <%# and %> delimiters and use the Eval and Bind functions. The Eval function is used to define one-way (read-only) binding. The Bind function is used for two-way (updatable) binding. The following example demonstrates how to bind a RadTimePicker control inside a RadGrid. To see the live example of the above see Binding to custom collections.